Your solution to reducing that rotten egg odor without using any chemicals. The twin-tank ProMate 6 Iron Curtain (IC) 2.0 is the most efficient way to remove iron, sulfur odor and black manganese without the use of chemicals. 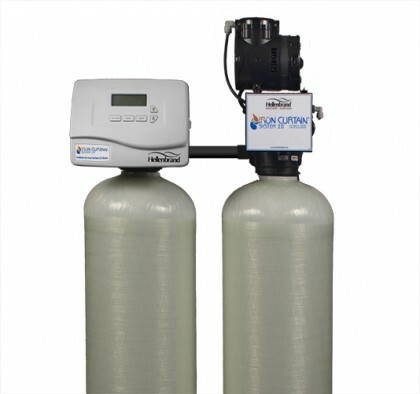 This twin tank model features a multi-media depth filter, making it more effective in filtration and can be custom programmed based on your water quality profile—which may save you thousands of gallons of water per year. Eliminating rust stains and black stains caused by iron and black manganese. Decreasing salt consumption for your water softener. On demand regeneration based upon water usage. Vortech™ plate saves up to 20 gallons of water per regeneration. Corrosion resistant control valve, body and tanks for a longer life. No damage to plants and animals. Patented technologies with over 16 years of proven reliability. Reduced pressure loss in the home. System designs for larger homes. Double tank systems for better iron and odor removal. Independent air recharge saves water with less frequent filter regeneration than single tank systems. Self-diagnostic software controls informs the homeowner about system operation such as flow rates, operation sequence, time and maintenance schedule and local service provider’s phone number.